The Department of English envisions youth with love for literature, desiring to explore the world of aesthetic pleasure, kindle their spirit to understand the science of language, improve their power of expression and linguistic competency leading to successful careers in diverse fields. Our mission is to inspire, motivate and encourage students to excel in their academics, be good communicators, foster employability skills among them by providing a platform to identify and nurture their inherent talent, promote their creative pursuits, build their self-esteem and make them well-rounded personalities. To create awareness about the importance of English as a global language. To cultivate research aptitude through comparative study of cultures and literatures. 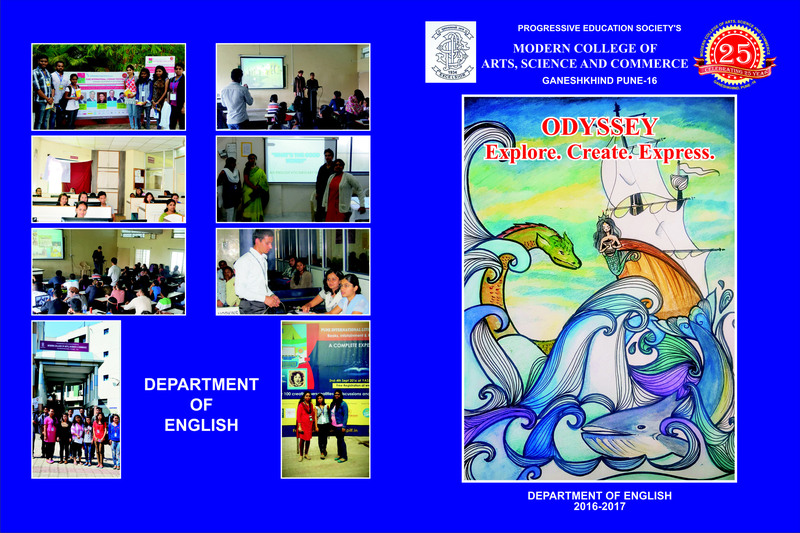 To acquaint students with catalytic effect of English in opening gateways to myriad career opportunities. To make students comprehend, analyze and appreciate literary texts. To enhance their personality, build their confidence through training in English communication viz. 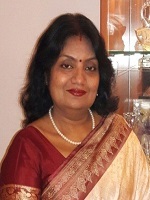 social etiquette, manners, polite conversations and formal and informal discourse etc. 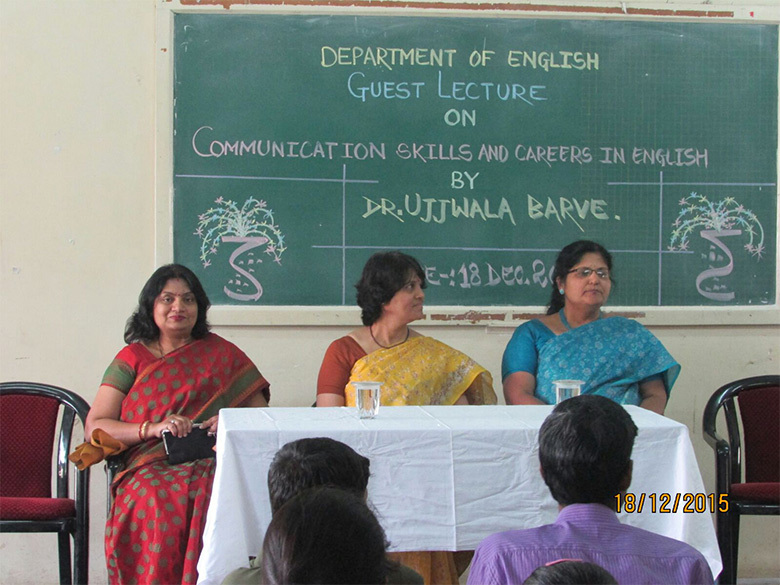 Department of English was instituted in the year 1992. English is taught at UG level for traditional programs in Arts, Commerce and Science and for professional courses like Computer Science, Biotechnology, Computer Applications and B. Voc. Objective of the course: It will be value addition to the curriculum. It will address the gap between ‘campus’ and ‘corporate’, accelerate career prospects, improve professional competency thereby increasing students’ employability. the birds would go mute. being cut down root by root. heaven would unveil its wrath. none would figure out the math. selling fresh flesh and assuring quality. you won't have a mother. for her to be dead is what they prefer. would you let a flower whither? would you be the silver lining? or would you just sit and wonder? all her intentions always pure and clean. and for the creatures which couldn't use words. will so strong, her spine wouldn't crack. legends have been told, of her courage and might. and yet they've set out to cut the roots. she never knew her gods were so clumsy. neither her sobbing nor laughter sound. do you remember her, her name was 'Earth'? 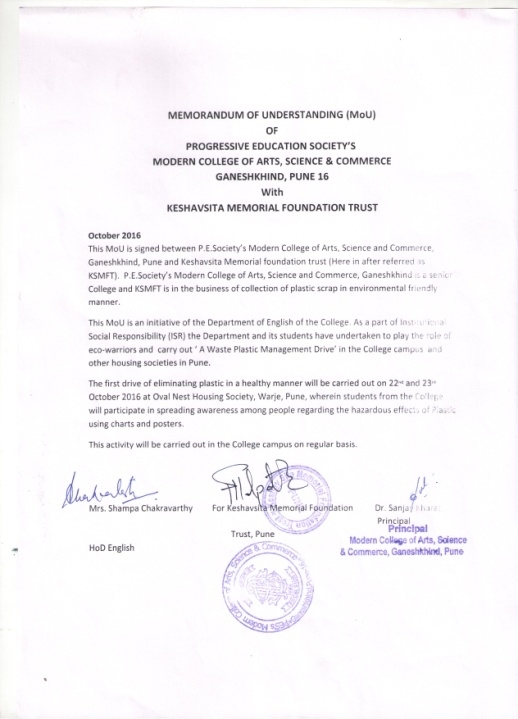 A Memorandum of Understanding (MoU) of Progressive Education Society’s Modern College of Arts, Science & Commerce Ganeshkhind, Pune -16 between Keshavsita Memorial Foundation Trust in October 2016. P. E. Society’s Modern College of Arts, Science and Commerce, Ganeshkhind is a senior College and KSMFT is in the business of collection of plastic scrap in environmental friendly manner. 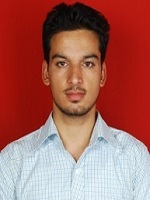 This MoU is an initiative of the Department of English of the College. 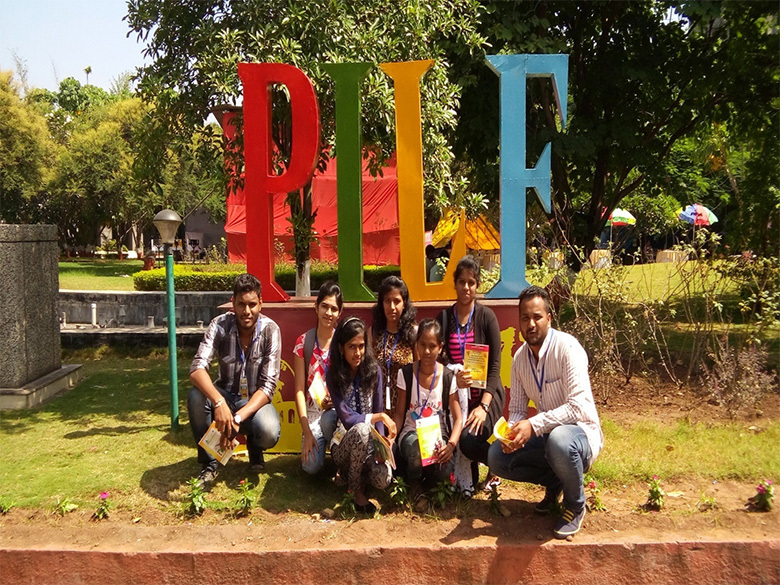 As a part of Institutional Social Responsibility (ISR) the Department and its students have undertaken to play the role of eco-warriors and carry out ‘A Waste Plastic Management Drive’ in the College campus and other housing societies in Pune. other housing societies in Pune.